The Product Management Lifestyle - Enova International, Inc.
We live in a dynamic, fast-paced world that demands continuous adaptation. Being a passionate learner, I believe we must be in constant motion—communicating, collaborating and evolving. As part of this commitment, I recently had the honor to be a part of the panel at a General Assembly event called “A Day in the Life of a Product Manager.” It was refreshing to be among people from diverse backgrounds (i.e. 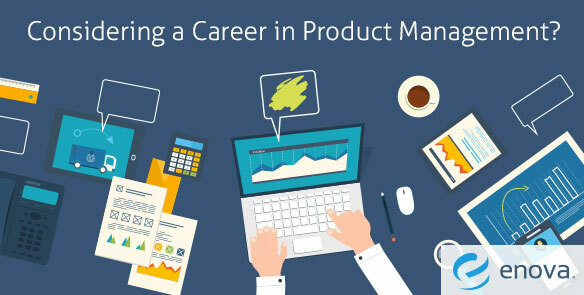 Economics, Engineering, MBA) with a common goal to create a career in Product Management. Sharing my experiences and answering these questions offered me an exceptional opportunity to reflect further. I realized Product Management is not just a profession, but it’s a lifestyle. Think about the way you learn things, make decisions, experience travel or new gadgets, and most of all, how you constantly challenge the status quo in your own unique way in your daily life. Product Management is all this and more! A successful Product Manager is a jack-of-all-trades and a master of some, who constantly delivers value with a team of experts. Every PM develops a strong understanding of customer, data, business and industry, while creating their niche in customer experience, technology, execution, or business development. So how do we connect the dots and transition into Product Management? Passion: What drives you to be a Product Manager? Find your favorite product and question what makes it special for you? What kind of problems and challenges give YOU an adrenaline rush? Effective Communication: Know your audience and have Empathy. Listen to your audience to find what they really care about. Personally, I have benefitted tremendously from the seminars offered by Landmark Worldwide, but that’s just one medium. Seek out ways to connect with people from different background and build your communication skills. Team Player: Collaborate with your team. Like I mentioned earlier, in today’s world, collaboration is the key to success. Most job roles will expose you to your own team or another department. Take the lead to work with them in your regular work hours or create ancillary projects to solve a problem, which could create an impact beyond just your team’s deliverables. Example: Automate a process or document something to simplify training. Being a Product Manager, it’s extremely important to keep your left brain active. Constantly seek what problems you enjoy solving and how it help others? Practice market sizing questions, case questions involving data analysis and design questions to solve an interesting problem. To build a career in any profession, it’s always important to have a strong foundation of the technical know-how. Spend some time reading and learn the industry lingo. Discover Agile Process or examine the differences between UX and UI. One of my all-time favorite books is “Inspired: How to Create Products Customers Love.” This book offers insightful perspectives on product management from someone who has years of experience working in Agile and non-Agile environments. You can learn more about the book here. Explore product management training sessions with organizations like General Assembly and Scrum Alliance. Seek opportunities to build your experience. Identifying what you bring to the table is a very important skill to have. Conversations with a professional mentor from the same industry are often helpful. Internship or volunteer opportunities in your own industry can help you quickly get onboard! The best advice I have ever received and the advice I’ll share with you all: action is better than inaction. There is no perfect path, so get out there and do something. Take action. Enjoy your product journey.